FILE - Ugandan lawmakers gather in the parliament to debate a move to change the constitution to extend the president's rule, in Kampala, Uganda, Sept. 21, 2017. Debate on age limits and term length for the president of Uganda came to a sudden halt Tuesday when a lawmaker reported seeing soldiers on the premises. The allegation led to a scuffle between legislators and parliamentary police. The legislature was already on edge because of the proposals being discussed. Parliament is debating a bill that would abolish the age limit for 75 presidential candidates, a move that would enable longtime President Yoweri Museveni to run for another term in the 2021 election. Opposition lawmakers and some members of the ruling party object to the bill, and debate that began Monday has been tumultuous. On Monday, shouting and chair-throwing forced Speaker Rebecca Kadaga to suspend six members of parliament. Business came to a standstill again Tuesday after legislator Doris Akol told colleagues she had seen soldiers in parliament's Catholic chapel. “For me, I am shocked. I am really really shocked. When I got there, both the Catholic and the Anglican chaplaincies were occupied by soldiers. They were eating from there. 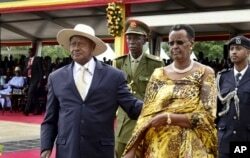 They have disorganized the whole place," Kadaga said. FILE - Uganda's longtime president Yoweri Museveni, left, and his wife Janet Museveniattend his last inauguration ceremony in the capital Kampala, May 12, 2016. Members of the opposition, many wearing or holding rosary beads, then tried to enter the chapels but instead engaged in a scuffle with security officers who blocked them. Last week, Kadaga issued new security guidelines that among other things stated parliament is a civil institution that should be guarded only by police, and that other security forces should stay away. When debate resumed after the scuffle Tuesday, Kadaga demanded an explanation. “So, I want to know, who are those people there? And I want the minister of internal affairs to explain who they are and they should apologize to this house, if you brought people here without my knowledge. I told you I want to know who is here for the civility of this institution. So I want to know if they are parliamentary police, why were they eating in the chaplaincies. What is their business in the chaplaincies? If they have come to pray, you don’t eat," Kadaga said. General Jeje Odong, the minister of internal affairs, said the officers were police, not military, and insisted they were not eating in the chapel. Legislators are currently giving their views on reports in favor and against the proposal to abolish the age limit. They are also debating whether terms for the president and parliament members should be increased from five to seven years. It is not clear when the proposals may be put to a vote.